Home»Blog»Make BackWPup»BackWPup 3.4.1 Release | BackWPup PRO Independence Discount! BackWPup 3.4.1 Release | BackWPup PRO Independence Discount! We’re happy to announce our BackWPup 3.4.1 release. In this version are primarily some bug fixes and other enhancements. To download the new release, simply head over to WordPress, or for the pro version, go to backwpup.com. Or, if you already have BackWPup installed, just update the plugin from your WP dashboard. Until July 5th, 2017, we have Independence Day Sales! We have a 30% discount on BackWPup PRO! But first things first: What new enhancements can you expect in BackWPup 3.4.1? Often times when users contact us for support, we need to ask all sorts of information to find out more about their environment. This screenshot shows how to send a debug info in BackWPup PRO. We’ve now put all this information in one convenient place for you to simply copy with one click and send over to us. And if you have BackWPup Pro, you can even contact us from right within the plugin and we get the debug info automatically, along with any logs you want to attach. We hope this will make your support experience much smoother. Users couldn’t exclude folders under wp-content. We added that feature now. Some users experienced a bug where old backup archives weren’t being deleted as expected. We fixed that in this release. For some users on hosts with open_basedir enabled, they were unable to backup their files. However, now we’ve put the proper checks in place to avoid this error. Only display Dropbox upload progress in debug mode. Allow user to copy debug info for support. Allow folders under wp-content to be excluded. Add Rate Us admin notice. Allow symbolic links to be excluded. Only encode DB values to hex when binary flag is set. Check if file is dot to prevent open_basedir warning. Fix PHP notice when running job via WP CLI. Fix the way Dropbox API wrapper handles errors. Support empty folder name when syncing to Dropbox. Fix handling of storing backups in root Dropbox dir. If archive name is not valid format, will still recognize and delete old files. Do not display admin notices for pro users. Add support form for pro users. If you’ve found a bug in BackWPup, please let us know over at Github. If you need support for the free plugin, please post on our support forum on WordPress. We do our best to answer all questions quickly. 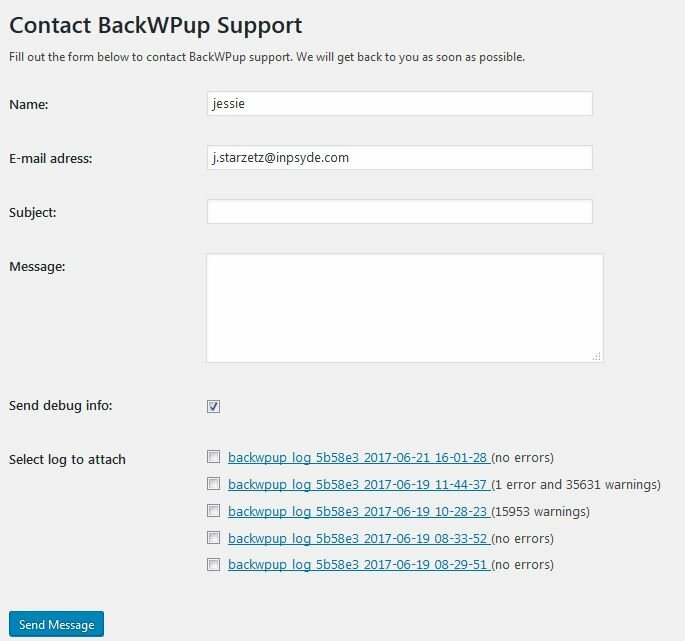 If you are a pro user, then please contact us via backwpup.com. As a pro user, you get priority support and we will ensure that we resolve your issue as quickly as possible. Thanks for using BackWPup. We appreciate all our users who find value in our plugin. If you have suggestions, feel free to let us know. Want to help us further improve BackWPup? Subscribe now as a beta tester! Don’t forget: Until July 5th, 2017, you get BackWPup PRO with a price reduction of 30%! Take a look at all additional features compared to BackWPup’s free version.